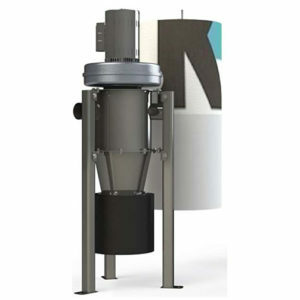 KEA’s 2000 Series Drum Mounted Two Stage Dust Collector to fit on top of 55 gallon drum, equipped with cast aluminum housing and fan for spark free performance, and heavy-duty industrial strength TEFC Motor. 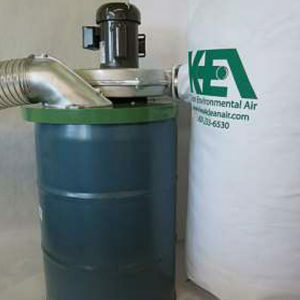 INCLUDES: Fully welded 12-gauge mild steel lid, motor, aluminum housing and fan, aluminum air intake directional scoop, 5’ clear heavy duty urethane flex hose, filter bag, hose clamps, and elbow. Made in USA. 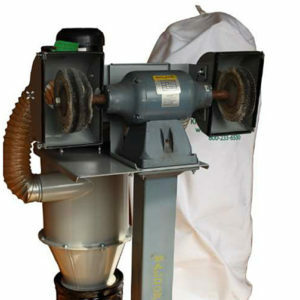 The collector utilizes a highly effective modified cyclone collection method: air is forced through the drum in a circular path allowing larger particulate to settle to bottom. Housing and fan blade are constructed of spark-proof cast aluminum for safety and low maintenance.